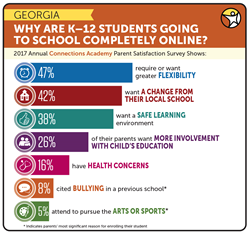 Though there are many reasons families choose virtual school, the school’s 2017 Parent Satisfaction Survey revealed that 47 percent of parents chose Georgia Connections Academy because they required or wanted greater flexibility. Additionally, 42 percent of parents enrolling wanted a change from their local school. Families interested in enrolling in Georgia Connections Academy are encouraged to do so early as the school has an enrollment limit of 4,000 students per state law. Through advanced technology tools and a rigorous curriculum, Georgia Connections Academy’s Georgia-certified teachers work closely with students to develop individualized learning plans which nurture strengths and provide additional support for areas of difficulty. The school provides students with a variety of courses, including engaging electives, Career Technical Education courses, and honors and AP course options. According to the school’s annual 2017 Parent Satisfaction Survey, 93% of parents agree that the curriculum is high quality and 92% of parents are satisfied with teachers' helpfulness. Families interested in Georgia Connections Academy are invited to attend an upcoming free in-person information session to learn about the curriculum, meet with teachers and staff, and thoroughly explore the school’s program. For those unable to attend an in-person session, real-time interactive online sessions with a school representative and an on-demand session accessible 24/7 are also available. The State Charter Schools Commission, the school’s authorizer, voted to renew Georgia Connections Academy for a 3-year term. The school and its authorizer are working together to finalize the charter contract. For more information or to begin the open enrollment process, please visit the school’s website at http://www.GeorgiaConnectionsAcademy.com. Georgia Connections Academy (GACA), established in 2011, is a high-quality, tuition-free public virtual charter school for students throughout the state for students in grades 6-12. Georgia Connections Academy offers families a personalized approach to education with Georgia-certified teachers and an award-winning curriculum that meets state standards. As a virtual charter school, students enjoy the freedom and flexibility of an online education, and are able to access their lessons anytime, anywhere there is an Internet connection. Georgia Connections Academy is authorized by the Georgia Charter Schools Commission, and is accredited by the Southern Association of Colleges & Schools Council on Accreditation and School Improvement (SACS CASI), an accrediting division of AdvancED. The school is headquartered in Duluth at 2763 Meadow Church Rd., Ste 208. For more information, visit the school’s website.